System setup and prewired to accept inputs from Type K furnace control / monitoring thermocouples. Components installed in a small Eurostyle table top enclosure, 204 mm high x 364 mm wide x 362 mm deep (8 in x 14.32 in x 14.25 in). Furnace wiring harness for SF-Series three-zone furnaces. Comes complete with three Model 2416 Eurotherm self-tuning digital temperature controllers, 1/16 DIN size (1.89 in x 1.89 in) controller. Each controller independently controls the temperature of a furnace zone. 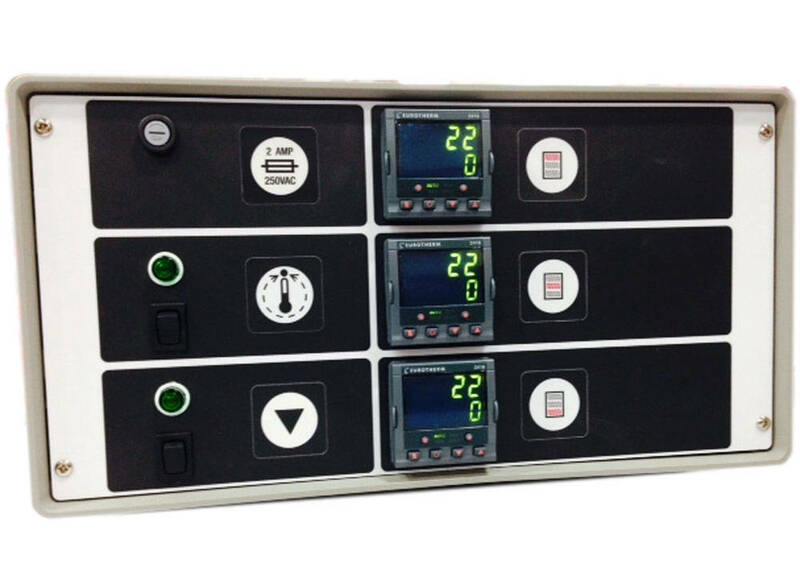 The user chooses a set point or test temperature and the controllers do the rest. This design will work with the control thermocouples located anywhere in the furnace zone, including attached to the specimen. Gradients of +/- 0.5C (+/- 1F) can be obtained in ideal conditions. Three 10 AMP zero cross-fired SCRs are incorporated for stable high current control of the power going to each furnace zone. The electrical isolation and heat sink cooling design offers long life and long time stability, which is very important for long term material testing applications like creep testing. An interrupt temperature control switch allows the user to "turn off" the power to the furnace while programming the temperature controller. This keeps the controller from going into the control mode until the operator enables control power. A neon indicator shows when the output is on. A pretest tuning switch allows the center zone only to control all three zones of the furnace. When used in conjunction with the auto tune feature of the zone controllers, initial tuning parameters can be determined with the center zone and then transferred manually to the other zones. A neon indicator shows when the controller is in the Test mode. Power requirements: 100-120VAC. 1 phase, 50/60Hz, 30 Amps. For 200-240V operation, optional transformer W-C015-TRAN is required.